The AUTO-PURGER® M is a compact and totally automatic, electronically-controlled, noncondensible gas refrigerant purger for reducing condensing pressure, and thereby saving electrical energy used by the refrigeration system. This deluxe purger is preassembled, prewired, tested, insulated, and includes an automatic water bubbler. Installation requires piping the “foul gas” line, liquid line, suction line, water line, drain line, and wiring the power connection and the remote ½" (13 mm) port purge point solenoid valves, which must be purchased separately. Up to four (4) purge points can be controlled by this purger. 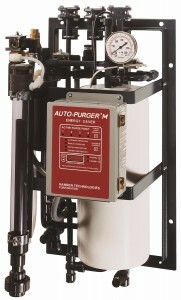 The AUTO-PURGER® M (APM) features welded piping and watertight electrical construction. The APM meets the requirements of the Canadian Standards Association (CSA certified).